The red and yellow Spanish flag that we know today, often referred to in Spanish as the rojigualda, was originally designed after the flag of the Spanish merchant and war marines during the reign of Carlos III (1785). Show your allegiance with the Swarovski 81823 BeCharmed Pavé Flag "Spain", branded with "Swarovski Crystals" and with its colors picked out in delicate, handset pavé crystals in Light Siam and Light Topaz colors. As a powerful symbol of origin, the BeCharmed Pavé Flag Beads will never go out of fashion. 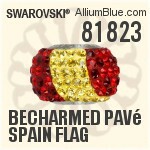 Swarovski 81823 BeCharmed Pavé Spain Flag consist of lead-free ADVANCED CRYSTAL by Swarovski.